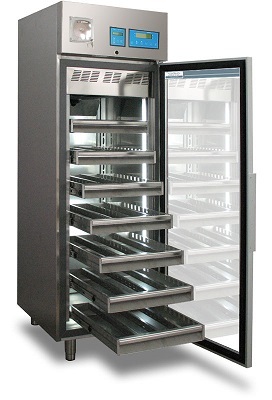 It is essential to record the temperature and humidity of medical refrigerator & freezers used for critical items. Such critical items are medicine, vaccine, plasma, blood samples etc. If the temperature goes above or below the permitted temperature levels, there should be alert to the operating personnel. This way the customer can have centralized monitoring, recording and protection of hospital refrigerators and freezers. 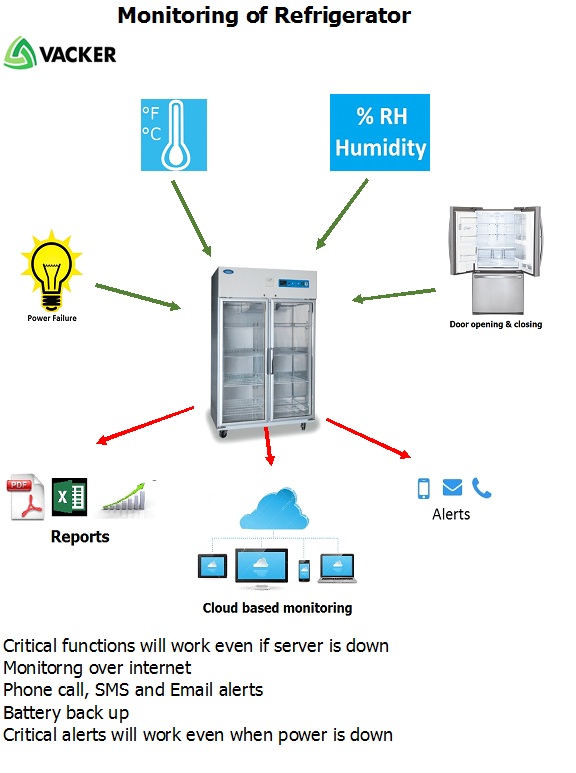 Our systems for medical refrigerator temperature monitoring will monitor and record continuously. They can provide an accuracy of up to +/- 0.1 Degree Celsius. We can monitor multiple units in different locations of a building. Also, we can connect to an existing LAN or WiFi connection. This way all the data of each medical refrigerator will be continuously available on a PC or over the internet. This system is suitable for centralized monitoring for storage of medicines, vaccines, human tissues, samples, food etc. stored under controlled conditions. 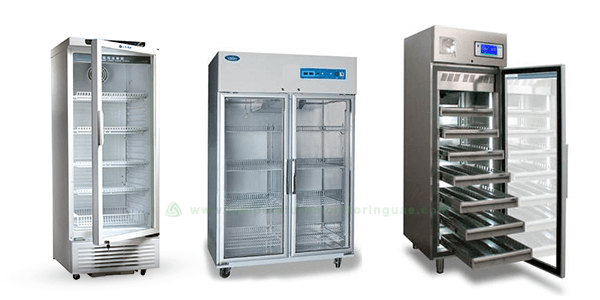 The same system can be used for walk-in chillers, cold rooms, medical fridges, warehouse etc. with expansion units. Remote medical refrigerator temperature monitoring alarms can be installed for all type of new and old types of medical refrigerators and freezers. 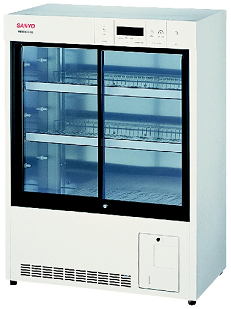 The display unit is installed on the outer body of the medical fridge. The sensors are placed inside the units either through the wall of the units or through the gaskets on the door. It is suitable for connection to any existing installations. For hospitals, a wireless system is ideal, which will not interrupt the functioning of the hospital. Wireless and wired versions of data loggers are available. The sensors of such medical refrigerator temperature monitoring alarms will communicate either on WiFi,Rf or Zigbee protocol. They can provide an accuracy of up to +/- 0.1 Deg. Celsius. This is comparable to all other data loggers used for similar applications. The sampling rate is programmable from 5 seconds to 1 hour. 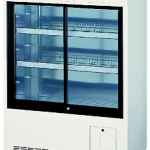 For medical fridge temperature monitoring, a sampling interval of 1 minute to 3 minutes is normally programmed. 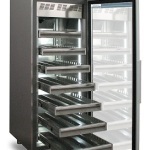 It is possible to program each device for each medical fridge separately for upper and lower limit of temperature. Also, different compartments of the same medical fridge can have different threshold limits. If the readings exceed these limits for a certain duration, it will generate alerts. 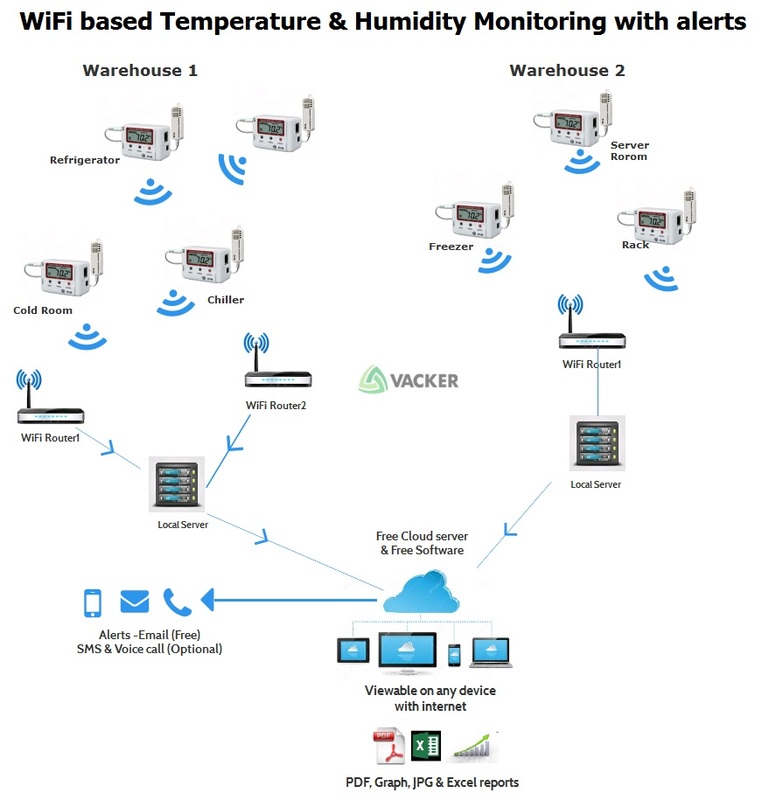 We can connect the local Temperature Alarm which generates an audible alarm upon an alert event. It is possible to connect each refrigerator alarm separately for each unit . Alternatively, we can provide a common alarm for a room containing multiple units. A separate phone call (with recorded voice message), Email and SMS alert system can be a standby system. Separate phone calls will be made for each refrigerator alarm. Measurements from -200 Deg. Centigrade onwards can be monitored. These are for cryogenic applications. 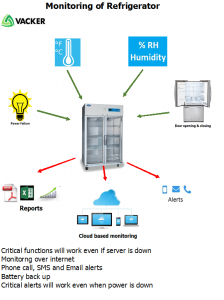 Monitor temperature & humidity of multiple freezers and refrigerators. There is no limit to the number of connected refrigerators since the system is cloud based. In the case of a temperature excursion, the following alerts will be generated. It will generate phone calls to 10 operators in a sequential manner. Upon attending the phone call it will deliver a customized voice message informing the type and location of the fault. The phone calls will be made repeatedly until someone attends the phone and acknowledges the call. It will also deliver SMS messages to the same operators or a different set of operators indicating the type and location of the fault. We can configure the SMS to convey the exact t emperature at the time of occurrence and the locations. It will send Email alerts to 4 email ids indicating the time, location and the exact temperature readings. Also, a local siren can be connected to alert a local operator or a security staff. The WiFi system has all the features explained above. However, the major difference is that the communication is through WiFi communication channels. No special transmitters or receivers are required and the commun ication will be through an existing WiFi network. 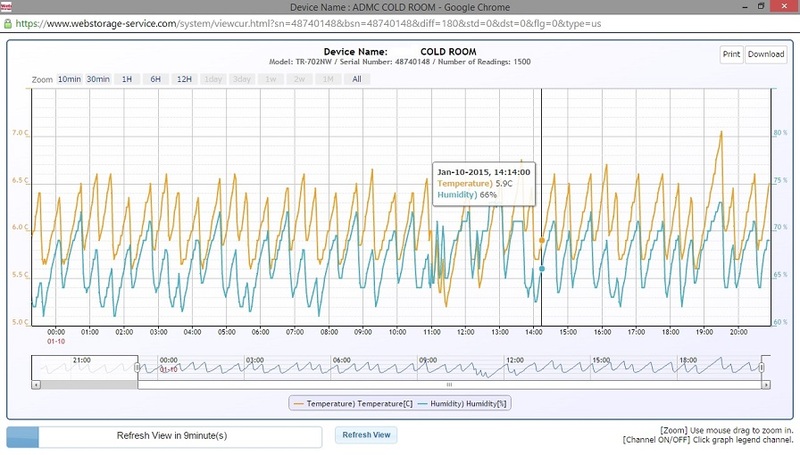 Each temperature data logger of medical fridge temperature monitoring will transmit the data continuously (every 60 seconds or as programmed by the user) to a local server network and onto the internet. We recommend WiFi or Wireless connections for medical fridges to have flexibility. You may constantly need to move or relocate the refrigerators. Also, you will need to take out the same for maintenance or repair. In case of wireless connections, you do not have to worry about disconnecting and reconnecting the LAN connection. 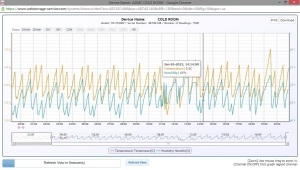 How to select a monitoring system for refrigerators and freezers? First of all you have to decide whether you want to record only temperature or whether you need humidity also. Generally you will need to record only temperature. Humidity inside a refrigerator will always be high due to frequent door opening. Also it is difficult to control the humidity inside a refrigerator. If you have single refrigerators across different rooms, you may go for a small device with single sensor with WiFi connectivity. You may not want wires to pass through different rooms. If you have 3 to 4 refrigerators in the same room, you may go for a system which has 4 sensors. You may note that each compartment of the refrigerator will need one sensor each. So if a refrigerator has two compartments with separate doors, you will need two sensors. If you have 8 or more refrigerators in the same room, you may go for a system which can connect to a big screen so that you can see all the readings and the alert on a single screen. You may not need Phone call alerts from each refrigerator. You can decide this based on the critical nature of the items stored in each medical refrigerator. If your power supply is not dependable, you will need devices with battery backup. Even in case of power failure, you should not lose the data. Also you may prefer to receive a separate critical alert in case of power failure. Needless to say, this power failure alert system for refrigerators should have battery backup. Otherwise it will not generate a phone call alert in case of a power failure. The data transmission will not happen in case of a power failure. However it should store the data in the device and transmission should happen when power comes back. This will be a useful feature even if your power supply is dependable. There are cloud based phone call alert systems and SIM card based phone call and SMS alert systems. The SIM card based alert system will work even in case of a power failure. However, the cloud based alert system will stop functioning as soon as power fails. Most importantly you have to check the annual subscription charges. You may prefer to buy a system without any monthly or annual charges. There are systems available which do not require any annual charges. However such systems also will charge for SMS and phone call charges. While comparing different vendors, you may evaluate a 5 year expenditure including annual charges. If you are in the United States, you may require a system complying with 21 CFR Part 11. However this is not mandatory in most of the other parts of the world, as per their local regulations. Obviously refrigerator monitoring systems complying to 21 CFR Part 11 will be costly. If you prefer so, you can look for system which automatically sends you a weekly or monthly recorded data. Most of the monitoring systems store the temperature and humidity data in their cloud platform and you can download as and when required. You may check how long this data will be stored by the provider. You may prefer to have indefinite storage on their cloud system. You also have to check the sampling interval, which is the frequency of data recording. For a refrigerator with very sensitive items, you may need a sampling interval of 1 minute to 3 minutes. However for a refrigerator with normal items, you may decide a sampling interval of 5 to 10 minutes. While selecting a system you have to check whether you can program a sampling interval from 30 seconds onwards. You should be able to program a delay timer before generating an alert. This is very important for a refrigerator since there will be door openings. As an example, for a refrigerator of 2 – 8 Deg. C, you may program that the system should make an alert only after a delay period of 5 minutes after the temperature rises above 8 Deg C. Otherwise you will receive repeated false alarms. If you require that the system should generate a phone call if the door is in open condition for a long time, you need to select a system with such a facility. Also you have to check the data policy of your organisation. Some organisations do not want to connect their systems to a cloud based server. They require that the entire software and the data should be only on their own server. Most of the systems have limitation to provide the same. We have seen such a policy especially for very big organisations, hospitals, airlines etc. There are refrigerator monitoring systems with or without a screen display. You can decide this based on your requirements. The devices with a display will be costlier than the one without a display. You may note that a single system may not be able to incorporate all of the above requirements. Hence you have to select your priorities to select the correct solution. You have to decide the type of alerts required by you. ie. Email, SMS, and phone call alerts. Also please check how many operators will receive the alerts. Also you may prefer that for different refrigerators, different operators should receive the alerts. eg. refrigerators in one room will be in control of one operator and another floor will be in control of another operator. We have different solutions meeting different criteria from the above list. We will assist you to select the right system. Please send your enquiry to our central sales department and your nearest office will contact you offering you a free consultation. Why & How to record door opening and closing of refrigerators & freezers? What is the function of liquid glycol/glycerin bottle in a medical refrigerator? Where to place a temperature & humidity sensor in a refrigerator?